Everything you need to know about facilitating organizational change and transformation. Thanks to scientific research, we now know a lot more about sociology, neuroscience, and organizational development than we did 20 years ago. During that time, scientists have discovered many pivotal lessons, but perhaps most importantly these three: 1) people have an innate need to be heard, 2) feelings drive behavior, and 3) communication is the key to successful organizational change initiatives. In other words, change can't be managed but it can—and should—be facilitated. And since organizations are made out of people, your most important task as a facilitator is to empower those people to drive change. But how are you supposed to listen to dozens—if not thousands—of people at once? And how do you keep them engaged during the whole process? To help you answer these questions and facilitate organizational change more effectively than ever before, we put together this guide, in which we share the mindset, skills, and tools you'll need to succeed. Ready to roll up your sleeves? Let's go! Before you can expect commitment from anyone, you must help them understand why the change initiative exists and why you're approaching it the way you're approaching it. However, instead of simply sticking to a single "why", you should help people find their own drivers. After all, a single change process is likely to have different outcomes, so let people focus on the ones that matter to them the most. For more insights on the importance of "Why", read Simon Sinek's "Start with Why"
Before you can move from A to B, you must understand how far apart they are from one another. Especially in larger organizations, people might struggle to see the big picture. That's why it's your job to give them the bird's eye view of the current situation and help them envision the desired state. People are different. Some are interested in money, others only care about other people. That's why it's important that you facilitate dialogue on various aspects of the change initiative. From the participants' feelings to the financial benefits, make sure that you keep ticking all the boxes off your communication list. Perhaps the most important skill a consultant or OD practitioner can possess is the ability to give a voice to all the participants. In other words, you'll want to make sure that they feel understood and appreciated. A skilled consultant can facilitate dialogue between hundreds if not thousands of people, and help them solve complex problems together. A large group of people can produce massive amounts of ideas, feelings, and information. While you can't make everyone's wishes come true, you can use the feedback to make sure that you're addressing everyone's ideas and concerns in your communication. After all, people are less likely to resist change if they understand where it stems from. The number of digital tools change consultants use in their daily work has grown exponentially over the past couple of years. With the ever-growing number of technologies, it's more important than ever to choose only the ones that truly support your process. While traditional tools focus on asynchronous communication outside of a workshop, remember to also look into tools that improve and enrich physical interaction. Holistic and versatile tools that allow you to involve the whole organization in transparent co-creation make it easier for your to coordinate, communicate, and implement change. It's a well-known fact that consequences drive behavior much more effectively than instructions. However, large change processes move so slowly that participants may get discouraged and demotivated halfway through them if they feel like nothing is happening. To combat participation fatigue, make sure to offer regular updates and enough credit for participation. Knowing that their input matters gives participants a boost that helps them keep going. When change strategy and execution are managed as two separate streams, you're much more likely to encounter resistance during execution. To avoid that pitfall, invite all stakeholders to share their ideas, hopes, and dreams before you even start crafting the strategy. And remember, that might include customers and other external stakeholders as well. 2. Spend some time with the "why"
As we concluded earlier, different people have different sources of motivation. In the beginning, you'll want to dig deeper into the unique feelings and forces that drive the participants' behavior. Remember to also tell stories and provide quantitative proof to back up the actual decisions. Change can feel uncomfortable simply because it's unknown. That's why it's important to paint a picture of what's to come—quite literally, since abstract ideas are typically a lot easier to communicate through visual cues like pictures, graphs and videos. Communication tends to spark new questions. As a change leader, it is your job to listen to those questions and answer them – preferably quite fast, since unanswered questions can cause uncertainty and frustration. With Howspace, you can easily create specific pages for feedback. Just remember to check back frequently to answer any open ones. Most change initiatives are communicated from a general perspective with a neutral tone. However, people in different departments and roles are likely to experience the process in different ways. That's why you might want to create local communities for people with shared perspectives, hopes, and fears. By letting everyone focus on their part of the change initiative, you're much more likely to get them to commit to the process. A "buddy system" can be a great way to speed things along. By becoming accountable to a small group of their peers, the participants are much more likely to keep their promises and deadlines. Remember that peer coaching can be facilitated asynchronously and/or remotely, which is a common requirement in modern organizations. Unfortunately organizational change initiatives can feel like extra-curricular activities to busy participants. After all, the ongoing change process doesn't take away the fact that everyone still have their normal tasks to do. Remember that you can nudge, poke, and inspire people to take part as often or as rarely as you see fit. Some people just seem to have more energy than others – and that's perfectly okay. That's why it might make sense to empower a small number of highly motivated individuals to drive change from within and reach out to people that would normally be difficult to get on board. With these change champions in your corner, your chances of success will increase considerably. As Kurt Levin's change theories from the 50's suggest, at any given time, there are multiple forces that are working for and against the change initiative. However, as change is constant movement, it's important to note that new obstacles may arise halfway through the process. That's why you'll want to keep up the dialogue that informs you of new challenges and opportunities throughout the process. With a sea of tools and technologies in use, organizational development initiatives and change processes can feel chaotic for both the facilitator and the participants. To help you choose the kinds of tools that best support your process, we put together a helpful list. The problem with traditional tools and technologies is that they all have their limitations in the context of longer-term change initiatives that involve a large group of people. That's why we created Howspace, a digital facilitation platform that functions as the home of all things change. Howspace allows you to facilitate a dialogue between hundreds of participants, regardless of their physical location. 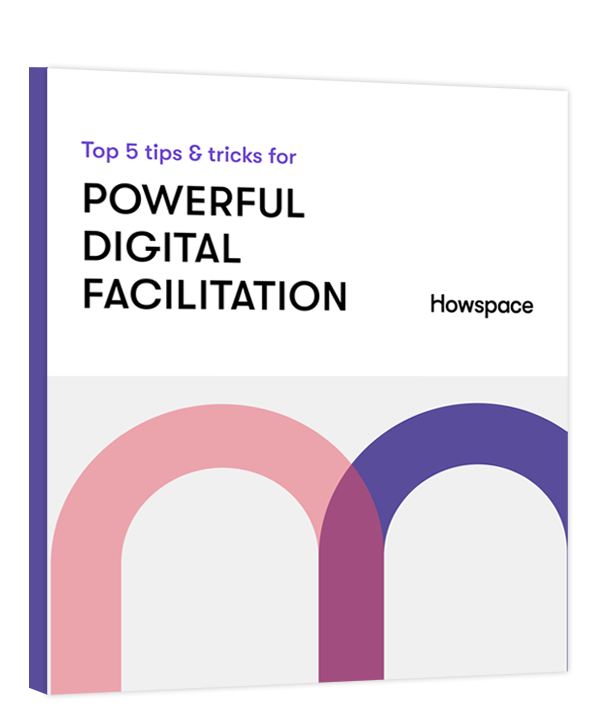 If you'd like to see what Howspace can do for your organization, open your trial workspace today! It's completely free and you don't need a credit card. Looking for useful resources or interesting stories about organizational change and development? Look no further. We asked 5 organizational development experts to share their best practices for facilitating change processes and learning programs using a digital platform.